usually after being a duke or grand marshall. The Queen is selected by secret ballot and announced only weeks before the parade, and is always a rescued/adopted female dog. Every year the Krewe of Barkus donates the proceeds of the parade registration fees, merchandise sales, and ball profits to worthy animal welfare groups. Barkus is the dog equivalent of Bacchus. The only Mardi Gras krewe in New Orleans by and for the canine population is ready to sniff the streets of the French Quarter on Sunday, February 24, 2019. The Mystic Krewe of Barkus is a non-profit organization founded by Wood Enterprises. 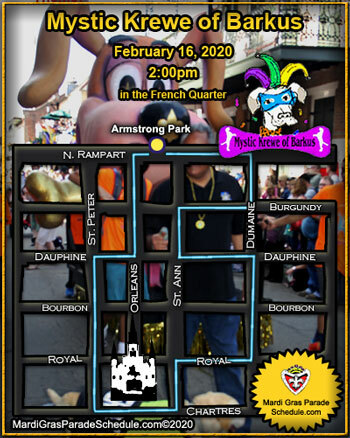 The 2019 Parade will start at Armstrong Park promptly at 2pm and proceed on their traditional 15-block route through the Vieux Carré, stopping at the VIP Reviewing Stand at Good Friends Bar, corner Dauphine and St. Ann, where VIPs (and those who desire to be VIPs) will toast the Royal Court. Membership in the parade krewe is open to all dogs - regardless of their past. Registration: NOW AVAILABLE ONLINE HERE. (http://www.barkus.org) Day-of-parade registration (Feb. 24) at Armstrong Park. Only dogs who are registered krewe members with parade tags will be allowed to be part of the parade. Check out our Membership Page to see esteemed levels of registration/membership. The only Mardi Gras krewe in New Orleans for the canine population. Founded in 1993, the Mystic Krewe of Barkus is a non-profit organization. The Mystic Krewe of Barkus was envisioned and created in November 1992 at a meeting of the Margaret Orr (WDSU-TV Weather Anchor) Fan Club held at Good Friends Bar. Thomas Wood brought his dog Jo Jo McWood to the meeting, where people complained about her neurotic ways. To get back at them all, Wood decided to make Jo Jo McWood queen of her parade and captain-for-life. Thus, the Krewe of Barkus was born. The first Krewe meeting was held January 25, 1993, when the Krewe (after many beers) officially elected Jo Jo McWood Queen Barkus I. Jager Freeman, dog of Scott Freeman, was selected as King Barkus I. The chosen theme was "Welcome To The Flea Market." Only members are eligible to be a part of the parade by purchasing parade registration (Dogluxe or above). You can also become a member without parading and support their worthwhile cause benefiting homeless animal rescue and adoption.